BMW i is The Next Big Thing. It could be the brand allure, or the hundreds of millions poured into making sure everybody knows about BMW i, but there’s no doubting that the new electric BMWs are garnering a lot of attention. It’s not really the BMW M cars, or the new wild creations at BMW these days that’s really gaining the brand kudos (front wheel drive 2er Active Tourer, 3-Series GT?). It’s the courage to step out and make your shareholders tremble a little, to make a big difference to the automotive industry. And from the very start, the BMW i project was always going to be ambitious. But that’s what we like about it. Lenspeed unfortunately cannot give you a first-hand experience of how BMW i cars drive (yet! 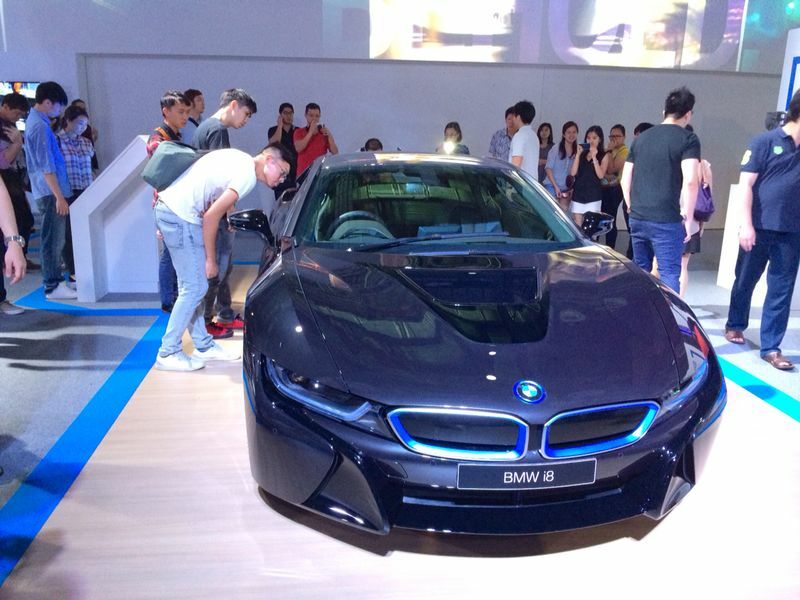 ), but sitting in an i3 at BMW World yesterday at Marina Bay Sands Singapore was a sweet taster of what is to come. The genuine care to create a carbon fibre reinforced plastic (CFRP) chassis is something we love very much at Lenspeed. Seeing at in all its raw glory at some parts of the interior is fantastic. Why hide a wonderful thing underneath? Then you look at the slightly frizzy door panels and then realise they are recycled natural materials, almost like cardboard but stiffer and more durable. It’s refreshingly different, not W220 S-Class coconut shells different, but in a way that speaks of quality and development at length. Even the seats, which are fabric, feel expensive to the touch, not unlike high-end furniture – we’d pick them over the predictable leather options. As your eyes gaze over the wood panels on the dashboard, you appreciate the elegant and beautiful architecture. It reeks of space, simplicity and modernity way more than any new Volvo can (until we see the new XC90’s interior!). Then you look at iDrive, and it’s so familiar, as are the A/C controls. There are so many familiar things, but so many new features as well that just delight, like the flat floor front and rear, which makes the car feel really airy. Pity then, that the rear can feel slightly hemmed in, especially when you can only open the rear doors if you open the front! A design flaw there in our eyes, something that the Mini Clubman suffered with faint praise, but I guess quirkiness comes justified with an electric car. That probably explains the exterior design as well, which is just plain… Weird. As a whole though, we really like the i3. At $230k ish, that’s almost the price of a Lexus CT200h, and I think our money will safely be in the hands of BMW with this one. There is just so much BMW is putting into these cars, we almost can’t help but feel the price is reasonable. And let’s not forget the i8. Which looked simply stunning on the show floor. A 1.5-litre engine in a supercar? You’d better believe it, because it’s true. It could well be good value simply because of its low road tax and fuel consumption! BMW is out on its own, at least for this year, among the German carmakers or indeed every car manufacturer with electric vehicles. And we applaud them – it’s a risk worth taking. We can’t wait to get our hands on them, especially an i8, even more than any contemporary M car.